A funny story about this book. When I was asked to be on the blog tour, I requested a digital galley of Miranda's debut novel. Less than a week later, I was cleaning up my office and FINALLY putting away all the awesome books I got at BEA (I'll get to you all one day, I promise!) and what did I come across? A copy of FRACTURE! Clearly I was meant to be on this blog tour, since all the way back in May I was already excited to read this book. 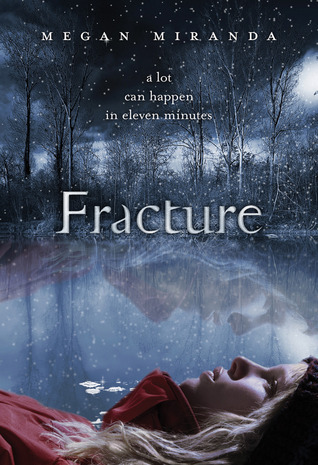 FRACTURE starts out with our main character, Delaney Maxwell, falling through the ice of a frozen pond in the middle of winter in Maine. And staying under...for 11 minutes. Her best friend Decker pulls her out, but by all accounts she should be dead. Even the scans of her brain show massive damage. But somehow she's alive, and appears to be totally normal. Except for one little thing...she can sense death. Pretty awesome set-up, right? I was pulled into the story of FRACTURE from page one. Miranda doesn't waste any time getting right into the action, or the consequences that come after and forever change your life. Delaney isn't able to go back to the ways things were, in more ways than one. Besides her new ability to sense death (it's an itch in her brain), Delaney has to deal with where she fits into the world, now that she's spent a week in a coma. Her doctor thinks she should be dead, her friends have started to move on without her, and her parents walk on eggshells around her. Even though I've thankfully never experienced something huge and scary like this, Delaney's experience was very relatable. For me, it reminded me of the reverse culture shock I experienced after coming home while studying abroad in college. For me, it seemed like no time had passed, but everything around me had kept moving, and it's a disorienting thing to go through, to say the least. Not that Delaney takes this all lying down--she's a take charge girl that made some awesome choices (and had me cheering her on) and some questionable ones (that made me cringe and go "Why Delaney, why?!" out loud once or twice)--which all boils down to the fact that she read like a real teenager, and a fully fleshed out one at that. Miranda had a knack for doing that with all her characters, really--even the friends that are only on the page for a scene or two felt so much like real people to me, it made it easy to fall into Delaney's life. And of course, there's a bit of mystery and boy drama thrown in--both of which I loved. Delaney's BFF is Decker, a boy. And then she meets Tony, a slightly older (19) guy who had survived a coma after a car wreck, and who Delaney feels oddly drawn to. But there's no love triangle in sight in this book--just real relationships that are complicated, and changing, and heartbreaking to read. Tony and Decker, while standing on their own as characters, also acted as excellent foils to showcase different parts of Delaney's life--most noticeable, pre- and post-coma--which helped add depth and heart to the story. FRACTURE reminded me both of THE BODY FINDER and IF I STAY in parts--the lingering sense of death and Delaney's ability gave me chills more than once. Watching her try to figure out her life post-coma made me tear up more than once. And even though it reminded me of both books, FRACTURE certainly stands on its own as a unique story. And it just may be your lucky day...I loved this book, so I'm definitely going out and getting a finished copy of it, which means my shelves just don't have room for another ARC! All you need to do to enter is fill out the form below...good luck! I've heard such great things about Fracture. Thanks so much for sharing your ARC. I really want to read this. FRACTURE looks like an amazing read. Love the cover. Ditto to Natalie up there! I am SO excited for this book. I love fast paced plots, and I've heard great things about the writing style in this one! This sounds really good. I'd love to read it. Thanks for the giveaway! Kid Lit Drink Night!! SCBWI Winter NYC!! The FNC Grows by One!